You wake up to a beautiful blanket of freshly fallen white snow on this fair city, look out of your window to marvel at its quiet beauty and then… PANIC! You parked outside of your apartment last night – finally an ideal spot – and hear the din of the plow coming down your perfectly down covered street. In a matter of seconds, your car is now "plowed in" and if the Public Works Department is doing its job, it's also been hit by a lovely mixture of rock salt and sand that is spraying from the back of the truck. Your idyllic snowy Boston morning has been irreparably damaged…And you haven't even started shoveling yet. Has this ever happened to you? Chances are if you own a car and live in the city, it has. And then you went through the arduous task of shoveling yourself out. Not a fun way to spend the morning! Luckily for you technology has been embraced by the City of Boston and you can even sign up for text message alerts to let you know when your car needs to be moved off of the street for a snow emergency, as well as for routine street cleaning. Depending on what part of the city you live in, you may observe another quaint tradition practiced by us Bostonians, the space holder. This author was born and bred here and has seen some pretty interesting space holders (a plaster bust of Elvis Presley takes the cake for me) but the City is cracking down on this tradition by removing place holders 48 hours after a snow emergency has been lifted, and it has been fading away as of late. We suggest next time it snows you head to South Boston and Dorchester to see some of the best examples! 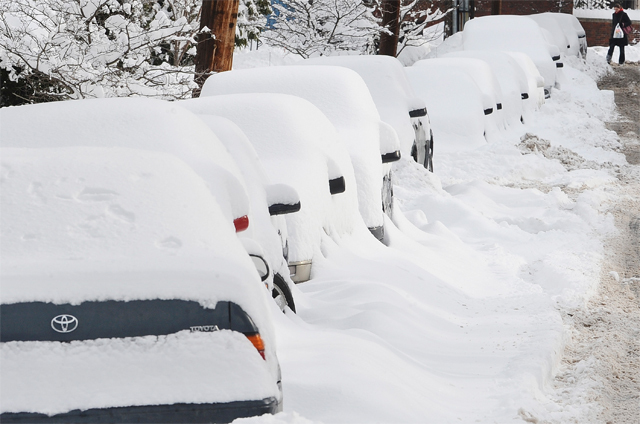 So what can you do to protect yourself from the dreaded plow-in? Well, first make sure to sign up for the aforementioned text alerts from the city. Also, you may want to install a local news app on your phone to get up to the minute updates on when the Mayor calls a snow emergency and you have to get your vehicle off the road. The City also has a great list of where you can go to park your car at a discounted rate during the snow emergency. And if all else fails, you can always just wait it out, and take the T!